Preserving and restoring patients’ teeth is a vital part of our practice. We understand that unforeseen tooth damage or decay can occur over time or at a moment’s notice. We provide advanced, quality procedures to best care for a patient’s damaged or decayed tooth. We desire to restore patients’ teeth with a natural look and feel leaving them with a radiant and confident smile. To best protect a patient’s damaged or decayed tooth, a dental crown is needed. Patients who are best candidates for a crown are those who are experiencing a weak or cracked tooth; a broken or severely worn-down tooth; or need additional coverage after a large filling. The crown is a tooth-like cover made from various materials that envelopes the whole tooth above the gum line. The full coverage of the crown restores shape, size, and strength while improving the appearance of the tooth. Overall, dental crowns are a prestigious option for repairing severely damaged teeth in addition to helping dental bridges remain in place. Based on the condition of your teeth, we offer a variety of different dental crowns made of Zirconia, Emax, or full porcelain. Prior to treatment our dentist will explain to you why she chose the type of material she selected for your tooth. 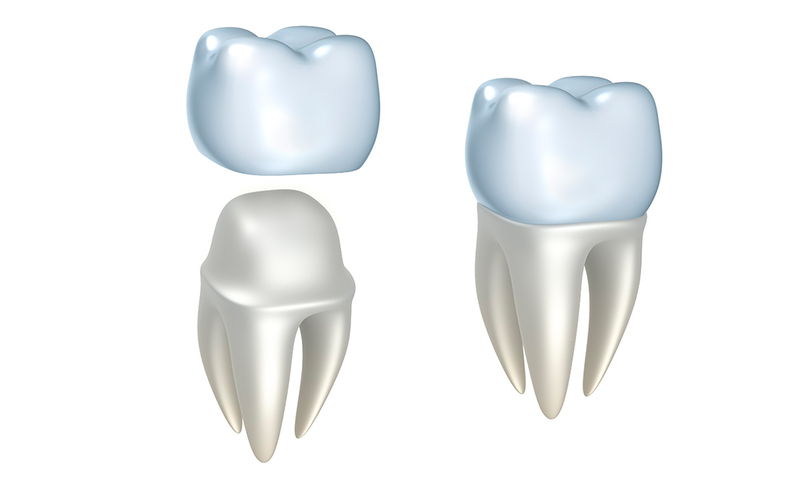 Some crowns can be bonded to your tooth for more protection. Each type has its benefits, and we offer these options based on your tooth's condition (providing your tooth with more longevity). For patients who are missing teeth, a dental bridge is needed to restore their smile. A dental bridge literally “bridges the gap” in a patient’s smile. To complete the bridge, dental crowns are placed both teeth that surround the gap followed by the false tooth positioned in between. Most patients find the natural look and feel of the bridge restores not only their oral health but also their confidence. Both dental crowns and bridges offer not only cosmetic benefits but also overall oral health benefits. Enhancements include restoring a patient’s smile and ability to speak and chew properly, maintain the shape of their face, and prevent remaining teeth from displacement. These benefits are achieved through the two-step process of preparing a patient’s mouth followed by the placement of the dental crown or bridge. Do you have a damaged tooth or gap in your smile? We would love the opportunity to help you restore your smile! Please call our office to schedule your consultation to find out if a dental crown or bridge is best for restoring your bright and healthy smile.